Perfect for taking to a Spring time or Mother’s Day get-together. Great accompaniment for the BLT Frittata or Spinach and Sausage Quiche. You'll want second helpings of this, but there's no need to feel guilty loading your plate high! It's the perfect salad to go with grilled meats for summer time meals. Our friend Rohnda came up with this recipe, she's the awesome THM who takes all the beautiful photos for us. Every time she takes this salad to get-togethers she's asked for the recipe. So, we're just sharing the love! If you are at, or close to goal weight, you can consider using a little raw honey as the sweetener here, but Rohnda tells us that the THM Gentle Sweet is perfect in this salad and it keeps it a slimming, sensational "S" dish. 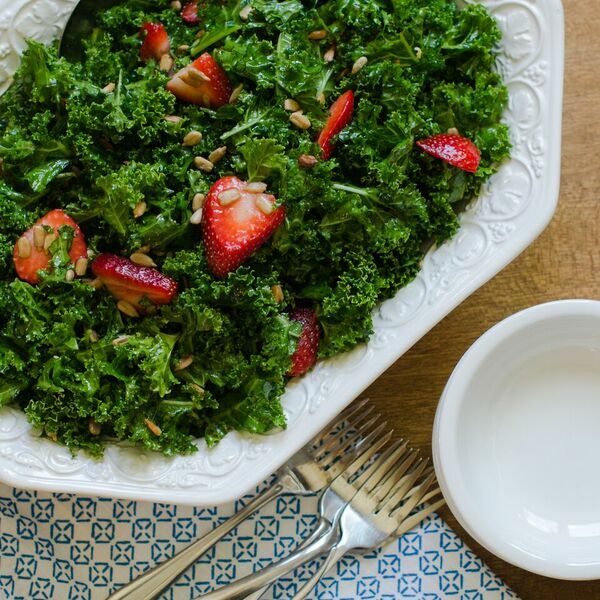 Place the shredded kale into a large bowl and drizzle olive oil over it. Using your hands, gently mix and massage olive oil into kale. This process will slightly wilt the kale and make for a softer leaf. In a small bowl, mix together the lemon juice, mineral salt, and sweetener. Pour over kale and combine well. Toss in the strawberries and sunflower seeds (or other nuts of your choice) just before serving along side your S meal.